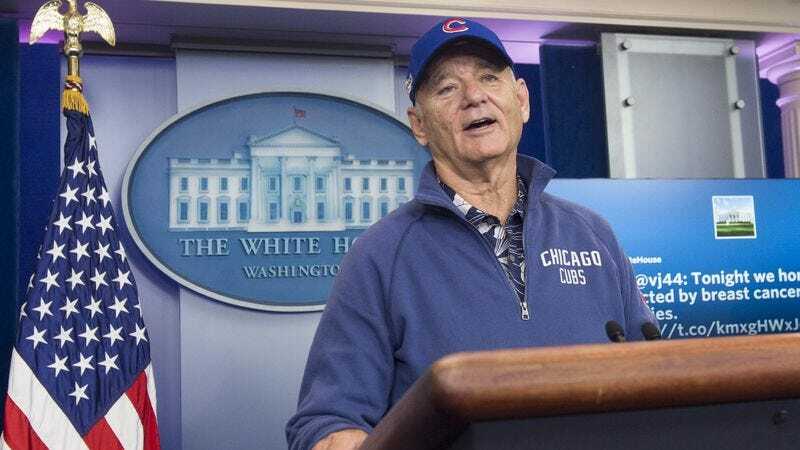 The White House press corps was treated today to the same mixture of delight and terror that accompanies any appearance by noted Loki-figure Bill Murray, when the Ghostbusters star suddenly appeared out of nowhere in their West Wing briefing room. By all accounts, Murray “held court” with the assembled journalists, fielding questions, suggesting they replace the coffee machine with “an ice luge,” and being generally very Bill Murray about the whole situation. Murray was in the White House to receive his Mark Twain Prize For American Humor from President Barack Obama, announced back in June. The actor is scheduled to be formally presented with the Prize on Sunday night, but there might be a big Cubs game that night, so it’s not clear if he’ll be able to swing by.